The PSW790 series has been discontinued. Please see the PSW-700 SERIES as a possible substitute or consult OMEGA's Pressure Engineering department. OMEGA’s PSW790 series switches are designed to satisfy most industrial switch requirements in harsh environments. The actuators have been proven in more than 20 years of service worldwide. 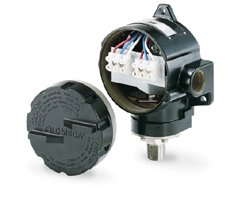 A Buna-N seal and SPDT switch is standard. Optional FKM or stainless steel seals extend media compatibility to most fluids, and the choice of either a hermetically sealed or dual SPDT switches will satisfy most switching applications. 注: Switches can generally be set between 15 and 100% of nominal range.